Games don’t cause violence, people do. Human beings have a tendency towards violence. Even the most casual observer of history knows this. Just examine all the interesting, innovative and frankly horrifying ways we’ve designed to injure and kill one another: the rack, drawing and quartering, bayonets, stoning, Columbian neckties, landmines, firebombs, biological, chemical and nuclear weapons—the list is nearly endless. In fact, our propensity to violence and the variety of means we’ve created to carry it out makes one wonder how the human species has managed to hang on this long. But it may all be over soon. Late in the 20th century, we developed a truly horrible weapon, one targeted at the most psychologically vulnerable of us—our children—and that turns all exposed to it into ruthless, mindless killers. We invented the videogame. Sounds kind of silly, right? But that’s exactly what videogame detractors would have us believe. Think about it: if there’s a violent act committed by one of our youth, videogames are identified as a—if not the—cause. This is nothing new. Emergent media has always suffered from suspicion and accusation—comic books, radio, TV, movies and videogames have all been viewed by many as harbingers of doom, heralding society’s imminent collapse. Not to be blunt, but they’re wrong. The fact that we’re having this exchange proves it. 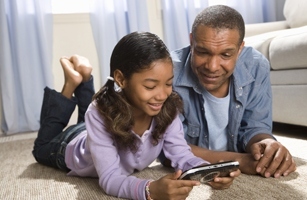 According to the Entertainment Software Association’s latest figures, 72% of US households play videogames. That’s a lot of potential killers. And yet we’re still here. Go figure. Now, before you accuse me of whoring for the media, let me make something clear: I don’t feel that overexposure to violent images in any form is a good idea. As a parent, I take my responsibility to filter what my son sees and experiences very seriously—and I would expect others to do the same. At the same time, I grew up watching TV and movies and playing games, and they didn’t turn me into a socially-maladjusted serial killer. In other words, use a little common sense, parents. Pay attention to your kids, and keep an eye on what they’re watching and playing. And get involved. Here’s a thought: if you’re really worried about what games your kids are playing, play with them. It’s a great way to gain a little knowledge (and a whole lot of perspective) and interact with your kids. And you might even enjoy it. Just hide the kitchen knives before you do. And here’s another article on videogames and violence in kids. Check out the Entertainment Software Association’s website here. And download a fact sheet about games and gamer demographics here.